3/12/08 — Heritage — Tournai, Cathedral — What is the use of being protected by UNESCO ? 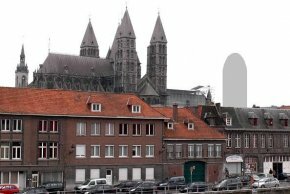 The question is well worth asking when seeing the project which Tournai, in Belgium, wishes to build in the immediate vicinity of the cathedral, within the perimeter of protection for the monument which was listed in 2000 among World Heritage Sites. 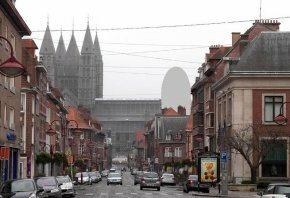 The project was presented in October 2008 : it consists of a concrete and glass building by Nicolas Michelin, a French architect, located 38 meters away from the cathedral and 48 meters high, that is 15 more than the nave. The visual impact on the skyline will be particularly noticeable, regardless of the spot one is standing (ill. 1 and 2). It is clearly in opposition to the restrictions set down by UNESCO which specifies : “When it is necessary to construct new buildings or adapt existing ones, the existing spatial layout should be respected, especially in terms of scale and lot size. A website has been opened and a petition has been launched.